Most people spend a significant amount of time each day using mobile-device keyboards: composing emails, texting, engaging in social media, and more. Yet, mobile keyboards are still cumbersome to handle. The average user is roughly 35% slower typing on a mobile device than on a physical keyboard. To change that, we recently provided many exciting improvements to Gboard for Android, working towards our vision of creating an intelligent mechanism that enables faster input while offering suggestions and correcting mistakes, in any language you choose. With the realization that the way a mobile keyboard translates touch inputs into text is similar to how a speech recognition system translates voice inputs into text, we leveraged our experience in Speech Recognition to pursue our vision. First, we created robust spatial models that map fuzzy sequences of raw touch points to keys on the keyboard, just like acoustic models map sequences of sound bites to phonetic units. Second, we built a powerful core decoding engine based on finite state transducers (FST) to determine the likeliest word sequence given an input touch sequence. With its mathematical formalism and broad success in speech applications, we knew that an FST decoder would offer the flexibility needed to support a variety of complex keyboard input behaviors as well as language features. In this post, we will detail what went into the development of both of these systems. Mobile keyboard input is subject to errors that are generally attributed to “fat finger typing” (or tracing spatially similar words in glide typing, as illustrated below) along with cognitive and motor errors (manifesting in misspellings, character insertions, deletions or swaps, etc). An intelligent keyboard needs to be able to account for these errors and predict the intended words rapidly and accurately. As such, we built a spatial model for Gboard that addresses these errors at the character level, mapping the touch points on the screen to actual keys. Average glide trails for two spatially-similar words: “Vampire” and “Value”. Up to recently, Gboard used a Gaussian model to quantify the probability of tapping neighboring keys and a rule-based model to represent cognitive and motor errors. These models were simple and intuitive, but they didn’t allow us to directly optimize metrics that correlate with better typing quality. Drawing on our experience with Voice Search acoustic models we replaced both the Gaussian and rule-based models with a single, highly efficient long short-term memory (LSTM) model trained with a connectionist temporal classification (CTC) criterion. However, training this model turned out to be a lot more complicated than we had anticipated. While acoustic models are trained from human-transcribed audio data, one cannot easily transcribe millions of touch point sequences and glide traces. So the team exploited user-interaction signals, e.g. reverted auto-corrections and suggestion picks as negative and positive semi-supervised learning signals, to form rich training and test sets. Raw data points corresponding to the word “could” (left), and normalized sampled trajectory with per-sample variances (right). A plethora of techniques from the speech recognition literature was used to iterate on the NSM models to make them small and fast enough to be run on any device. The TensorFlow infrastructure was used to train hundreds of models, optimizing various signals surfaced by the keyboard: completions, suggestions, gliding, etc. After more than a year of work, the resulting models were about 6 times faster and 10 times smaller than the initial versions, they also showed about 15% reduction in bad autocorrects and 10% reduction in wrongly decoded gestures on offline datasets. While the NSM uses spatial information to help determine what was tapped or swiped, there are additional constraints — lexical and grammatical — that can be brought to bear. A lexicon tells us what words occur in a language and a probabilistic grammar tells us what words are likely to follow other words. To encode this information we use finite-state transducers. FSTs have long been a key component of Google’s speech recognition and synthesis systems. They provide a principled way to represent various probabilistic models (lexicons, grammars, normalizers, etc) used in natural language processing together with the mathematical framework needed to manipulate, optimize, combine and search the models*. In Gboard, a key-to-word transducer compactly represents the keyboard lexicon as shown in the figure below. It encodes the mapping from key sequences to words, allowing for alternative key sequences and optional spaces. This transducer encodes “I”, “I’ve”, “If” along paths from the start state (the bold circle 1) to final states (the double circle states 0 and 1). Each arc is labeled with an input key (before the “:”) and a corresponding output word (after the “:”) where ε encodes the empty symbol. The apostrophe in “I’ve” can be omitted. The user may skip the space bar sometimes. To account for that, the space key transition between words in the transducer is optional. The ε and space back arcs allow accepting more than one word. A probabilistic n-gram transducer is used to represent the language model for the keyboard. A state in the model represents an (up to) n-1 word context and an arc leaving that state is labeled with a successor word together with its probability of following that context (estimated from textual data). These, together with the spatial model that gives the likelihoods of sequences of key touches (discrete tap entries or continuous gestures in glide typing), are combined and explored with a beam search. Generic FST principles, such as streaming, support for dynamic models, etc took us a long way towards building a new keyboard decoder, but several new functionalities also had to be added. When you speak, you don’t need the decoder to complete your words or guess what you will say next to save you a few syllables; but when you type, you appreciate the help of word completions and predictions. Also, we wanted the keyboard to provide seamless multilingual support, as shown below. Trilingual input typing in Gboard. It was a complex effort to get our new decoder off the ground, but the principled nature of FSTs has many benefits. For example, supporting transliterations for languages like Hindi is just a simple extension of the generic decoder. In many languages with complex scripts, romanization systems have been developed to map characters into the Latin alphabet, often according to their phonetic pronunciations. For example, the Pinyin “xièxiè” corresponds to the Chinese characters “谢谢” (“thank you”). A Pinyin keyboard allows users to conveniently type words on a QWERTY layout and have them automatically “translated” into the target script. Likewise, a transliterated Hindi keyboard allows users to type “daanth” for “दांत” (teeth). Whereas Pinyin is an agreed-upon romanization system, Hindi transliterations are more fuzzy; for example “daant” would be a valid alternative for “दांत”. Transliterated glide input for Hindi. Just as we have a transducer mapping from letter sequences to words (a lexicon) and a weighted language model automaton providing probabilities for word sequences, we built weighted transducer mappings between Latin key sequences and target script symbol sequences for 22 Indic languages. Some languages have multiple writing systems (Bodo for example can be written in the Bengali or Devanagari scripts) so between transliterated and native layouts, we built 57 new input methods in just a few months. The general nature of the FST decoder let us leverage all the work we had done to support completions, predictions, glide typing and many UI features with no extra effort, allowing us to offer a rich experience to our Indian users right from the start. All in all, our recent work cut the decoding latency by 50%, reduced the fraction of words users have to manually correct by more than 10%, allowed us to launch transliteration support for the 22 official languages of India, and enabled many new features you may have noticed. While we hope that these recent changes improve your typing experience, we recognize that on-device typing is by no means solved. Gboard can still make suggestions that seem nonintuitive or of low utility and gestures can still be decoded to words a human would never pick. 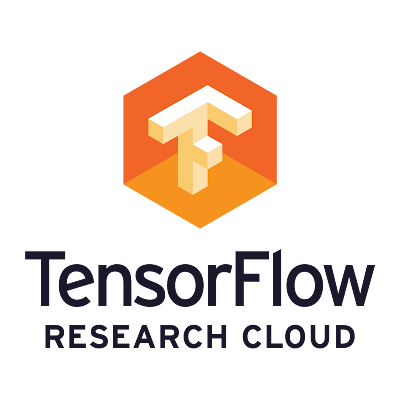 However, our shift towards powerful machine intelligence algorithms has opened new spaces that we’re actively exploring to make more useful tools and products for our users worldwide. This work was done by Cyril Allauzen, Ouais Alsharif, Lars Hellsten, Tom Ouyang, Brian Roark and David Rybach, with help from Speech Data Operation team. Special thanks go to Johan Schalkwyk and Corinna Cortes for their support. 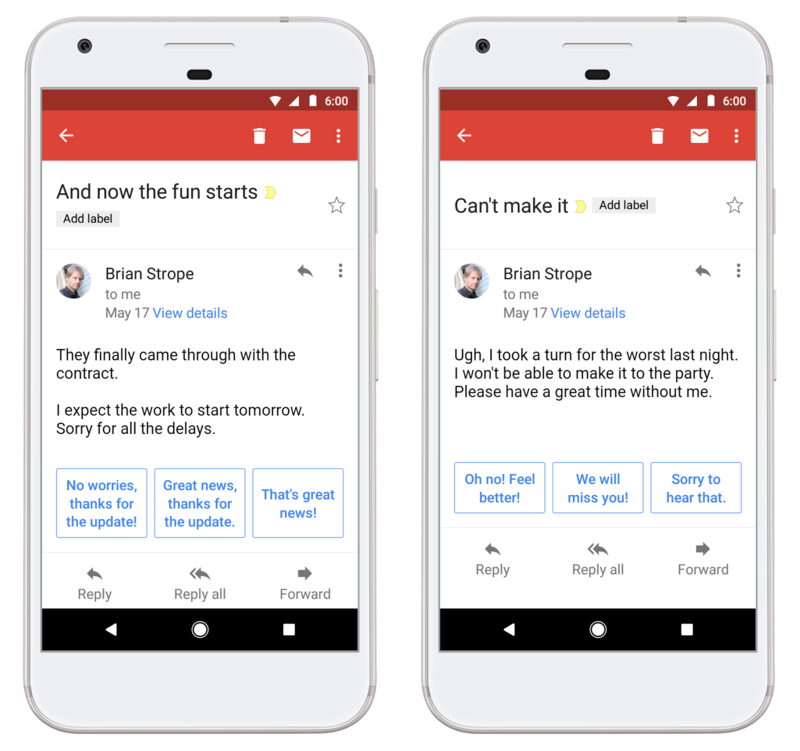 Last year we launched Smart Reply, a feature for Inbox by Gmail that uses machine learning to suggest replies to email. Since the initial release, usage of Smart Reply has grown significantly, making up about 12% of replies in Inbox on mobile. 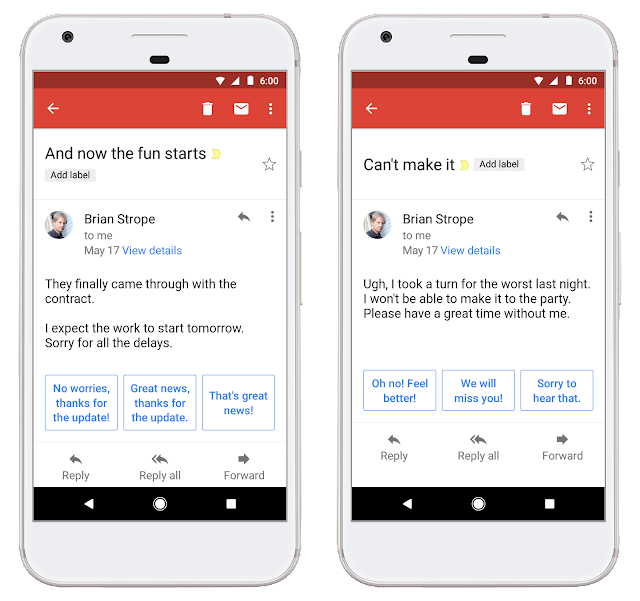 Based on our examination of the use of Smart Reply in Inbox and our ideas about how humans learn and use language, we have created a new version of Smart Reply for Gmail. This version increases the percentage of usable suggestions and is more algorithmically efficient. Inspired by how humans understand languages and concepts, we turned to hierarchical models of language, an approach that uses hierarchies of modules, each of which can learn, remember, and recognize a sequential pattern. The content of language is deeply hierarchical, reflected in the structure of language itself, going from letters to words to phrases to sentences to paragraphs to sections to chapters to books to authors to libraries, etc. Consider the message, "That interesting person at the cafe we like gave me a glance." The hierarchical chunks in this sentence are highly variable. The subject of the sentence is "That interesting person at the cafe we like." The modifier "interesting" tells us something about the writer's past experiences with the person. We are told that the location of an incident involving both the writer and the person is "at the cafe." We are also told that "we," meaning the writer and the person being written to, like the cafe. Additionally, each word is itself part of a hierarchy, sometimes more than one. A cafe is a type of restaurant which is a type of store which is a type of establishment, and so on. In proposing an appropriate response to this message we might consider the meaning of the word "glance," which is potentially ambiguous. Was it a positive gesture? In that case, we might respond, "Cool!" Or was it a negative gesture? If so, does the subject say anything about how the writer felt about the negative exchange? A lot of information about the world, and an ability to make reasoned judgments, are needed to make subtle distinctions. Given enough examples of language, a machine learning approach can discover many of these subtle distinctions. Moreover, a hierarchical approach to learning is well suited to the hierarchical nature of language. We have found that this approach works well for suggesting possible responses to emails. We use a hierarchy of modules, each of which considers features that correspond to sequences at different temporal scales, similar to how we understand speech and language. Each module processes inputs and provides transformed representations of those inputs on its outputs (which are, in turn, available for the next level). In the Smart Reply system, and the figure above, the repeated structure has two layers of hierarchy. The first makes each feature useful as a predictor of the final result, and the second combines these features. By definition, the second works at a more abstract representation and considers a wider timescale. 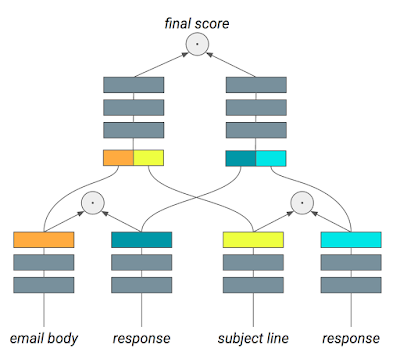 By comparison, the initial release of Smart Reply encoded input emails word-by-word with a long-short-term-memory (LSTM) recurrent neural network, and then decoded potential replies with yet another word-level LSTM. 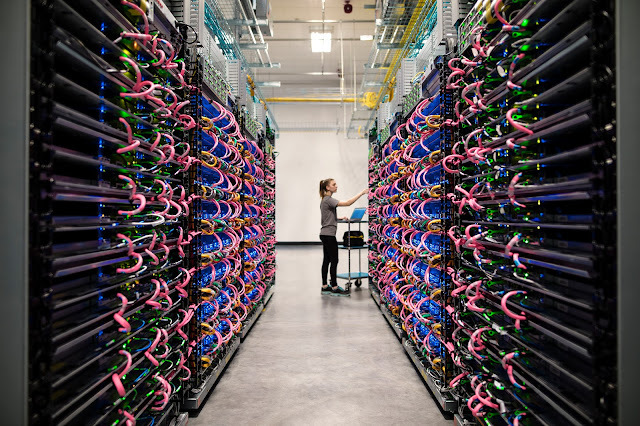 While this type of modeling is very effective in many contexts, even with Google infrastructure, it’s an approach that requires substantial computation resources. Instead of working word-by-word, we found an effective and highly efficient path by processing the problem more all-at-once, by comparing a simple hierarchy of vector representations of multiple features corresponding to longer time spans. We have also considered whether the mathematical space of these vector representations is implicitly semantic. Do the hierarchical network representations reflect a coarse “understanding” of the actual meaning of the inputs and the responses in order to determine which go together, or do they reflect more consistent syntactical patterns? Given many real examples of which pairs go together and, perhaps more importantly which do not, we found that our networks are surprisingly effective and efficient at deriving representations that meet the training requirements. So far we see that the system can find responses that are on point, without an overlap of keywords or even synonyms of keywords.More directly, we’re delighted when the system suggests results that show understanding and are helpful. The key to this work is the confidence and trust people give us when they use the Smart Reply feature. As always, thank you for showing us the ways that work (and the ways that don’t!). With your help, we’ll do our best to keep learning. Every day, participants of online communities form and share their opinions, experiences, advice and social support, most of which is expressed freely and without much constraint. These online discussions are often a key resource of information for many important topics, such as parenting, fitness, travel and more. However, these discussions also are intermixed with a clutter of disagreements, humor, flame wars and trolling, requiring readers to filter the content before getting the information they are looking for. And while the field of Information Retrieval actively explores ways to allow users to more efficiently find, navigate and consume this content, there is a lack of shared datasets on forum discussions to aid in understanding these discussions a bit better. To aid researchers in this space, we are releasing the Coarse Discourse dataset, the largest dataset of annotated online discussions to date. The Coarse Discourse contains over half a million human annotations of publicly available online discussions on a random sample of over 9,000 threads from 130 communities from reddit.com. To create this dataset, we developed the Coarse Discourse taxonomy of forum comments by going through a small set of forum threads, reading every comment, and deciding what role the comments played in the discussion. We then repeated and revised this exercise with crowdsourced human editors to validate the reproducibility of the taxonomy's discourse types, which include: announcement, question, answer, agreement, disagreement, appreciation, negative reaction, elaboration, and humor. From this data, over 100,000 comments were independently annotated by the crowdsourced editors for discourse type and relation. Along with the raw annotations from crowdsourced editors, we also provide the Coarse Discourse annotation task guidelines used by the editors to help with collecting data for other forums and refining the task further. An example thread annotated with discourse types and relations. Early findings suggest that question answering is a prominent use case in most communities, while some communities are more converationally focused, with back-and-forth interactions. This work was done by Amy Zhang during her internship at Google. We would also like to thank Bryan Culbertson, Olivia Rhinehart, Eric Altendorf, David Huynh, Nancy Chang, Chris Welty and our crowdsourced editors. Taking, sharing, and viewing selfies has become a daily habit for many — the car selfie, the cute-outfit selfie, the travel selfie, the I-woke-up-like-this selfie. Apart from a social capacity, self-portraiture has long served as a means for self and identity exploration. For some, it’s about figuring out who they are. For others it’s about projecting how they want to be perceived. Sometimes it’s both. Photography in the form of a selfie is a very direct form of expression. It comes with a set of rules bounded by reality. Illustration, on the other hand, empowers people to define themselves - it’s warmer and less fraught than reality. Today, Google is introducing a feature in Allo that uses a combination of neural networks and the work of artists to turn your selfie into a personalized sticker pack. 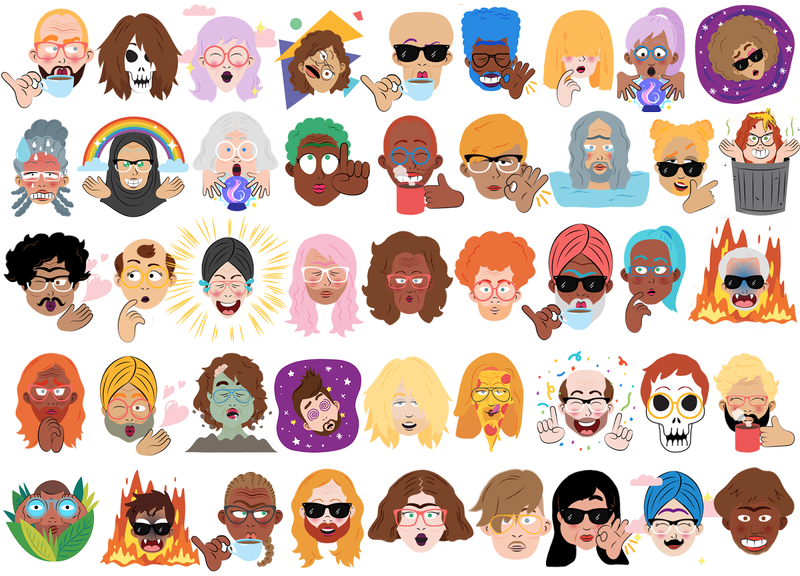 Simply snap a selfie, and it’ll return an automatically generated illustrated version of you, on the fly, with customization options to help you personalize the stickers even further. The traditional computer vision approach to mapping selfies to art would be to analyze the pixels of an image and algorithmically determine attribute values by looking at pixel values to measure color, shape, or texture. However, people today take selfies in all types of lighting conditions and poses. 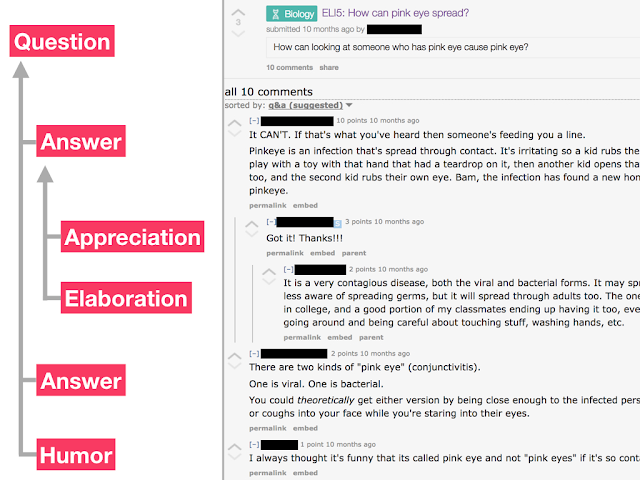 And while people can easily pick out and recognize qualitative features, like eye color, regardless of the lighting condition, this is a very complex task for computers. When people look at eye color, they don’t just interpret the pixel values of blue or green, but take into account the surrounding visual context. In order to account for this, we explored how we could enable an algorithm to pick out qualitative features in a manner similar to the way people do, rather than the traditional approach of hand coding how to interpret every permutation of lighting condition, eye color, etc. While we could have trained a large convolutional neural network from scratch to attempt to accomplish this, we wondered if there was a more efficient way to get results, since we expected that learning to interpret a face into an illustration would be a very iterative process. That led us to run some experiments, similar to DeepDream, on some of Google's existing more general-purpose computer vision neural networks. We discovered that a few neurons among the millions in these networks were good at focusing on things they weren’t explicitly trained to look at that seemed useful for creating personalized stickers. Additionally, by virtue of being large general-purpose neural networks they had already figured out how to abstract away things they didn’t need. All that was left to do was to provide a much smaller number of human labeled examples to teach the classifiers to isolate out the qualities that the neural network already knew about the image. To create an illustration of you that captures the qualities that would make it recognizable to your friends, we worked alongside an artistic team to create illustrations that represented a wide variety of features. Artists initially designed a set of hairstyles, for example, that they thought would be representative, and with the help of human raters we used these hairstyles to train the network to match the right illustration to the right selfie. We then asked human raters to judge the sticker output against the input image to see how well it did. In some instances, they determined that some styles were not well represented, so the artists created more that the neural network could learn to identify as well. Raters were asked to classify hairstyles that the icon on the left resembled closest. Then, once consensus was reached, resident artist Lamar Abrams drew a representation of what they had in common. In the study of aesthetics, a well-known problem is the uncanny valley - the hypothesis that human replicas which appear almost, but not exactly, like real human beings can feel repulsive. In machine learning, this could be compounded if were confronted by a computer’s perception of you, versus how you may think of yourself, which can be at odds. Rather than aim to replicate a person’s appearance exactly, pursuing a lower resolution model, like emojis and stickers, allows the team to explore expressive representation by returning an image that is less about reproducing reality and more about breaking the rules of representation. The team worked with artist Lamar Abrams to design the features that make up more than 563 quadrillion combinations. Reconciling how the computer perceives you with how you perceive yourself and what you want to project is truly an artistic exercise. This makes a customization feature that includes different hairstyles, skin tones, and nose shapes, essential. After all, illustration by its very nature can be subjective. Aesthetics are defined by race, culture, and class which can lead to creating zones of exclusion without consciously trying. As such, we strove to create a space for a range of race, age, masculinity, femininity, and/or androgyny. Our teams continue to evaluate the research results to help prevent against incorporating biases while training the system. There is no such thing as a ‘universal aesthetic’ or ‘a singular you’. The way people talk to their parents is different than how they talk to their friends which is different than how they talk to their colleagues. It’s not enough to make an avatar that is a literal representation of yourself when there are many versions of you. To address that, the Allo team is working with a range of artistic voices to help others extend their own voice. This first style that launched today speaks to your sarcastic side but the next pack might be more cute for those sincere moments. Then after that, maybe they’ll turn you into a dog. If emojis broadened the world of communication it’s not hard to imagine how this technology and language evolves. What will be most exciting is listening to what people say with it. This feature is starting to roll out in Allo today for Android, and will come soon to Allo on iOS. This work was made possible through a collaboration of the Allo Team and Machine Perception researchers at Google. We additionally thank Lamar Abrams, Koji Ashida, Forrester Cole, Jennifer Daniel, Shiraz Fuman, Dilip Krishnan, Inbar Mosseri, Aaron Sarna, Aaron Maschinot and Bhavik Singh. Every day, Google Maps provides useful directions, real-time traffic information and information on businesses to millions of people. In order to provide the best experience for our users, this information has to constantly mirror an ever-changing world. While Street View cars collect millions of images daily, it is impossible to manually analyze more than 80 billion high resolution images collected to date in order to find new, or updated, information for Google Maps. One of the goals of the Google’s Ground Truth team is to enable the automatic extraction of information from our geo-located imagery to improve Google Maps. In “Attention-based Extraction of Structured Information from Street View Imagery”, we describe our approach to accurately read street names out of very challenging Street View images in many countries, automatically, using a deep neural network. 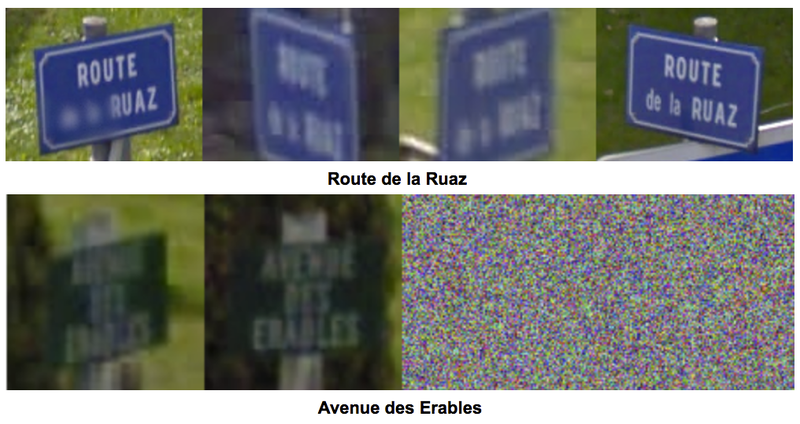 Our algorithm achieves 84.2% accuracy on the challenging French Street Name Signs (FSNS) dataset, significantly outperforming the previous state-of-the-art systems. Importantly, our system is easily extensible to extract other types of information out of Street View images as well, and now helps us automatically extract business names from store fronts. We are excited to announce that this model is now publicly available! Example of street name from the FSNS dataset correctly transcribed by our system. Up to four views of the same sign are provided. Text recognition in a natural environment is a challenging computer vision and machine learning problem. While traditional Optical Character Recognition (OCR) systems mainly focus on extracting text from scanned documents, text acquired from natural scenes is more challenging due to visual artifacts, such as distortion, occlusions, directional blur, cluttered background or different viewpoints. Our efforts to solve this research challenge first began in 2008, when we used neural networks to blur faces and license plates in Street View images to protect the privacy of our users. From this initial research, we realized that with enough labeled data, we could additionally use machine learning not only to protect the privacy of our users, but also to automatically improve Google Maps with relevant up-to-date information. In 2014, Google’s Ground Truth team published a state-of-the-art method for reading street numbers on the Street View House Numbers (SVHN) dataset, implemented by then summer intern (now Googler) Ian Goodfellow. This work was not only of academic interest but was critical in making Google Maps more accurate. Today, over one-third of addresses globally have had their location improved thanks to this system. In some countries, such as Brazil, this algorithm has improved more than 90% of the addresses in Google Maps today, greatly improving the usability of our maps. The next logical step was to extend these techniques to street names. To solve this problem, we created and released French Street Name Signs (FSNS), a large training dataset of more than 1 million street names. The FSNS dataset was a multi-year effort designed to allow anyone to improve their OCR models on a challenging and real use case. FSNS dataset is much larger and more challenging than SVHN in that accurate recognition of street signs may require combining information from many different images. These are examples of challenging signs that are properly transcribed by our system by selecting or combining understanding across images. The second example is extremely challenging by itself, but the model learned a language model prior that enables it to remove ambiguity and correctly read the street name. Note that in the FSNS dataset, random noise is used in the case where less than four independent views are available of the same physical sign. With this training set, Google intern Zbigniew Wojna spent the summer of 2016 developing a deep learning model architecture to automatically label new Street View imagery. One of the interesting strengths of our new model is that it can normalize the text to be consistent with our naming conventions, as well as ignore extraneous text, directly from the data itself. Example of text normalization learned from data in Brazil. Here it changes “AV.” into “Avenida” and “Pres.” into “Presidente” which is what we desire. In this example, the model is not confused from the fact that there is two street names, properly normalizes “Av” into “Avenue” as well as correctly ignores the number “1600”. While this model is accurate, it did show a sequence error rate of 15.8%. However, after analyzing failure cases, we found that 48% of them were due to ground truth errors, highlighting the fact that this model is on par with the label quality (a full analysis our error rate can be found in our paper). This new system, combined with the one extracting street numbers, allows us to create new addresses directly from imagery, where we previously didn’t know the name of the street, or the location of the addresses. Now, whenever a Street View car drives on a newly built road, our system can analyze the tens of thousands of images that would be captured, extract the street names and numbers, and properly create and locate the new addresses, automatically, on Google Maps. But automatically creating addresses for Google Maps is not enough -- additionally we want to be able to provide navigation to businesses by name. In 2015, we published “Large Scale Business Discovery from Street View Imagery”, which proposed an approach to accurately detect business store-front signs in Street View images. However, once a store front is detected, one still needs to accurately extract its name for it to be useful -- the model must figure out which text is the business name, and which text is not relevant. We call this extracting “structured text” information out of imagery. It is not just text, it is text with semantic meaning attached to it. Using different training data, the same model architecture that we used to read street names can also be used to accurately extract business names out of business facades. In this particular case, we are able to only extract the business name which enables us to verify if we already know about this business in Google Maps, allowing us to have more accurate and up-to-date business listings. 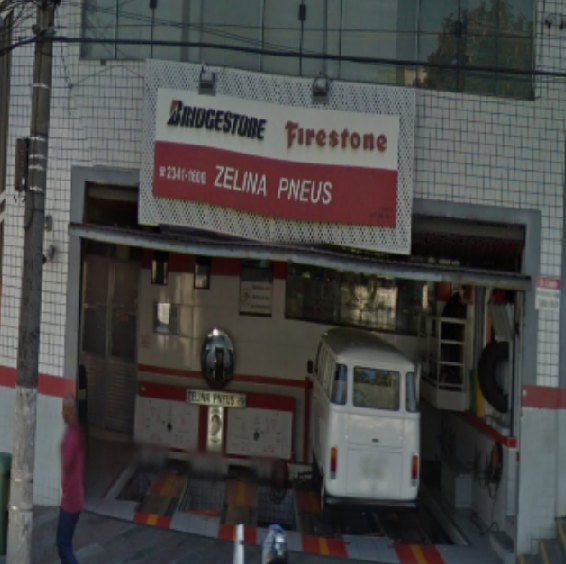 The system is correctly able to predict the business name ‘Zelina Pneus’, despite not receiving any data about the true location of the name in the image. Model is not confused by the tire brands that the sign indicates are available at the store. Applying these large models across our more than 80 billion Street View images requires a lot of computing power. This is why the Ground Truth team was the first user of Google's TPUs, which were publicly announced earlier this year, to drastically reduce the computational cost of the inferences of our pipeline. People rely on the accuracy of Google Maps in order to assist them. While keeping Google Maps up-to-date with the ever-changing landscape of cities, roads and businesses presents a technical challenge that is far from solved, it is the goal of the Ground Truth team to drive cutting-edge innovation in machine learning to create a better experience for over one billion Google Maps users.